Batu city is located in 800 meters above sea level, with cold temperature 17-25,6 degree of Celsius. 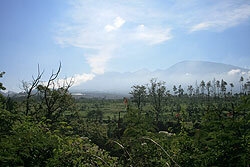 Batu city is an area in East Java that surrounded by mountains. Geographically, Batu is tropic area. The potencies of this area are coming from the agro product properties, fruits, vegetables, mountain panorama and the hills. When the visitors enter to Batu city, the fresh mountain air has welcomed us. Batu City is the main tourism object for domestic and foreign tourists. There are many tourism objects in Batu that become the dream object for those visitors, especially its mountain tour. To support those tourism objects, Batu has facilitated with hotels, inns, villas and the other lodges, which has mountain nuance. Beside that, Batu city also called as “Batu City A Millions Beauty”. Beside as tourism city, Batu City has many kinds of art culture, both art and tradisional culture, such as; Kuda Lumping (Horse Dance), Campursari (Javanese Music), etc. 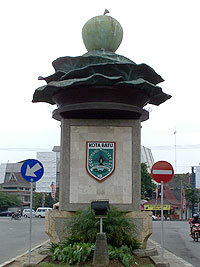 Batu is also known as agro city area and artist city, because it has many art and painting galleries. Batu city also produces apples, vegetables, and garlic.